Are you not able to get the desired quality for your artworks or photos printed on canvas? Come to Superchrome - the ultimate service provider in canvas printing! In any kind of printing, the right printer is most important. Being a professional large format printing company, we make use of the most innovative canvas printers available. Printing artworks and photos on canvas needs utmost care and attention. Utilizing state-of-the-art canvas printing technology, we are able to handle any kind of challenge in canvas printing. We guarantee to generate stunning prints on canvas using our cutting-edge printers. Our canvas printer can create prints with high resolution color and vibrancy which will last for generations. Your fine artwork reproduction will look exactly as the original work. For better results, we use pigment-based water resistant and UV resistant inks. Depending on your needs, you can choose from water-based inks and solvent-based inks. Based on your requirements, you can opt from different kinds and sizes of canvas. 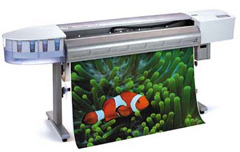 Our canvas printer can print on rigid and flexible canvas ranging in size from A2 to 60x40". The quality of print will be constant in all print sizes. As a successful digital printing company, we provide end to end service for all your printing needs. You will be surprised at the wide range of unsurpassed services we are able to offer you at competitive rates. So entrust your next canvas printing need to us. We will complete the work in fast turnaround time. Our prints are delivered bubble wrapped if stretched and sent by Royal Mail. We assure a fast turn over time of just two to three days. Our high quality canvas prints are very competitively priced. Contact us for quotes. If you would like to know more about our canvas printers, any of the projects shown or if you want to discuss any project you have coming up then contact us 020 7237 9333 or fax 020 7237 9444 or email sales@superchrome.co.uk. Our experienced personnel would be able to guide you appropriately.